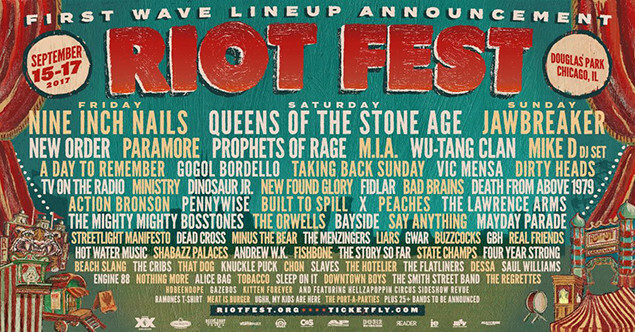 A whole bunch of bands have been announced for Riot Fest - which takes place at Chicago's Douglas Park from September 15 - 17 this year! Paramore, A Day To Remember, Real Friends, State Champs and LOADS more are on the line-up, plus headliners Nine Inch Nails, Queens Of The Stone Age and Jawbreaker. A bunch of bands will be playing seminal albums for the festival, and we'll find out which of the below artists will be doing that on April 20. Oh, and there are 25+ more artists yet to be announced. NICE.